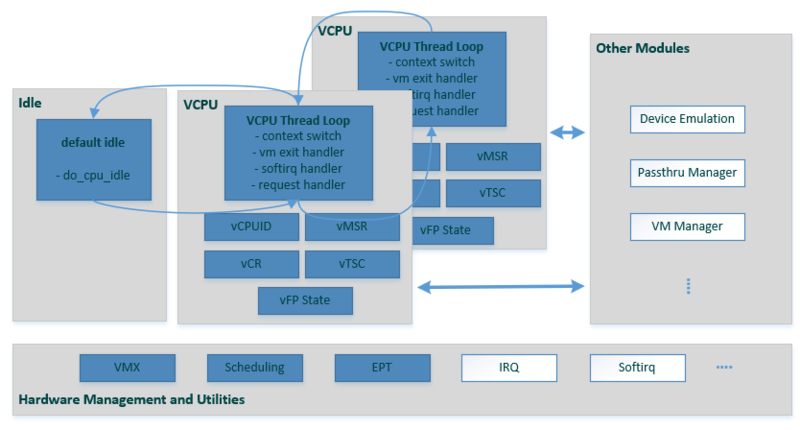 The following sections discuss the major modules (shown in blue) in the CPU virtualization overview shown in Figure 46.
simple schedule: only two thread loops are maintained for a CPU - vCPU thread and default idle thread. A CPU runs most of the time in the vCPU thread for emulating a guest CPU, switching between VMX root mode and non-root mode. A CPU schedules out to default idle when an operation needs it to stay in VMX root mode, such as when waiting for an I/O request from DM or ready to destroy. CPU partitioning is a policy for mapping a virtual CPU (VCPU) to a physical CPU. 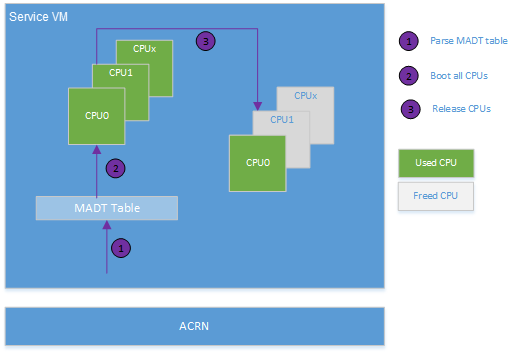 The current ACRN implementation forces a static 1:1 mapping between VCPUs and physical CPUs and does not support multiple VCPUs running on a physical CPU and does not support VCPU migration from one physical CPU to another. ACRN forces a fixed 1:1 mapping between a VCPU and a physical CPU when creating a VCPU for the guest Operating System. This makes the VCPU management code much simpler. An array is used to track the physical CPU allocation information. When a VCPU is created, we query, allocate, and update the array to map the VCPU to an available physical CPU. The physical CPU number assignment for each guest is pre-defined. For example, on a platform with four CPU cores, one physical CPU is assigned to run the Service Operating System (SOS) and other three physical CPUs are assigned to run the User Operating System (UOS) instances. To improvement SOS boot time, all physical CPUs are assigned to the SOS during the SOS boot. Afterward, the physical CPUs defined for the UOS are allocated by the Device Model (DM) by running the launch_uos.sh script. With ACRN, all ACPI table entries are pass-thru to the SOS, including the Multiple Interrupt Controller Table (MADT). The SOS sees all physical CPUs by parsing the MADT when the SOS kernel boots. All physical CPUs are initially assigned to the SOS by creating the same number of virtual CPUs. When the SOS boot is finished, it releases the physical CPUs intended for UOS use. Here is an example flow of CPU allocation on a multi-core platform. When we create a VCPU in the hypervisor, an available physical CPU is picked and marked as used. When we destroy the VCPU, we mark the physical CPU as available again. free_pcpu() marks the physical CPU available again. Currently, the ACRN hypervisor does not support virtual CPU migration to different physical CPUs. This means no changes to the virtual CPU to physical CPU can happen without first calling destroy_vcpu. vm: pointer to vm data structure, this vcpu will owned by this vm. 0: vcpu created successfully, other values failed. set the vcpu to running state, then it will be scheculed. Adds a vCPU into the run queue and make a reschedule request for it. It sets the vCPU state to VCPU_RUNNING. 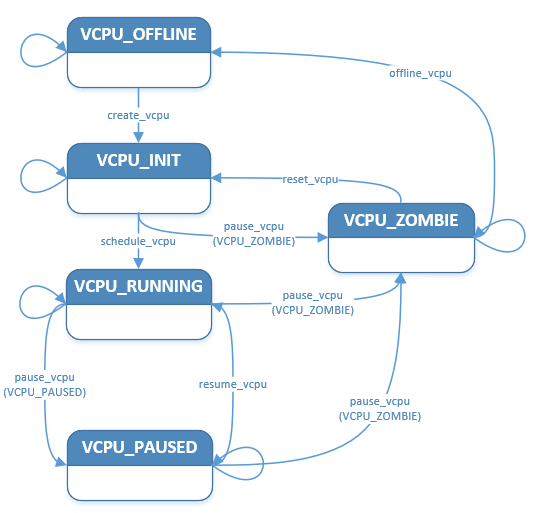 Change a vCPU state to VCPU_PAUSED or VCPU_ZOMBIE, and make a reschedule request for it. 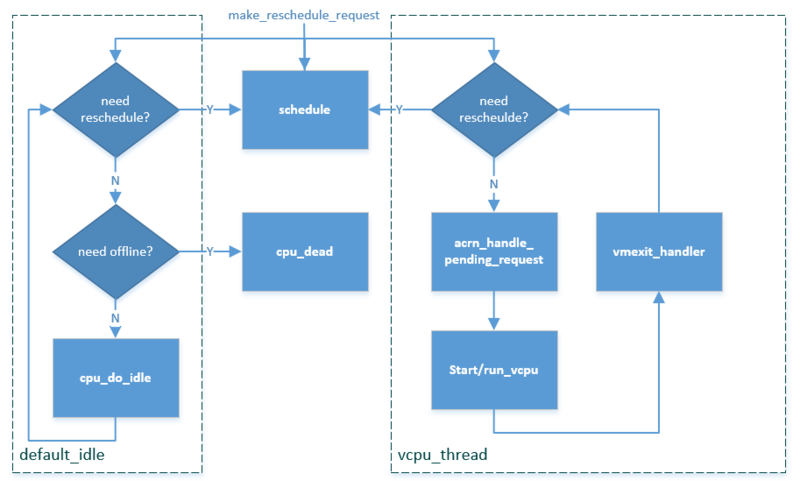 Change a vCPU state to VCPU_RUNNING, and make a reschedule request for it. Reset all fields in a vCPU instance, the vCPU state is reset to VCPU_INIT. An interface in vCPU thread to implement VM entry and VM exit. A CPU switches between VMX root mode and non-root mode based on it. 0: vcpu run successfully, other values failed. 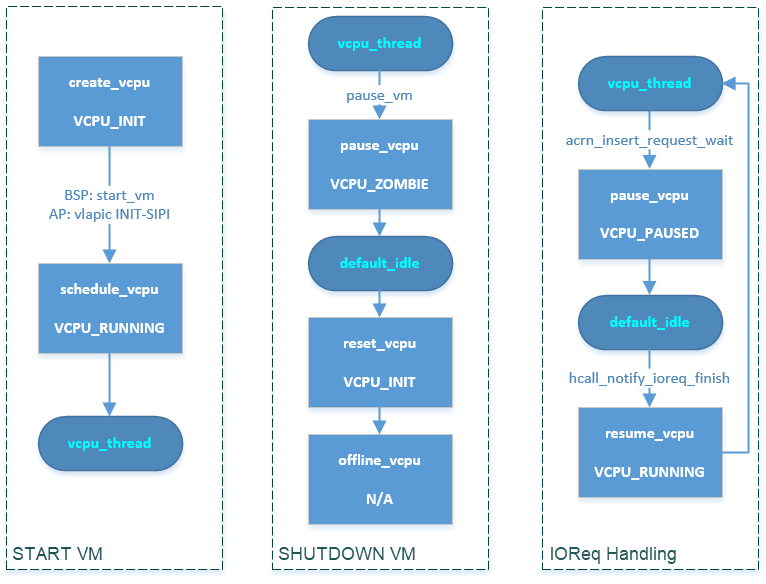 The vcpu_thread loop will try to initialize a vCPU’s vmcs during its first launch and then do the loop of handling its associated softirq, vm exits, and pending requests around the VM entry/exit. It will also check the reschedule request then schedule out to default_idle if necessary. See vCPU Thread for more details of vcpu_thread. The default_idle loop simply does do_cpu_idle while also checking for need-offline and reschedule requests. If a CPU is marked as need-offline, it will go to cpu_dead. If a reschedule request is made for this CPU, it will schedule out to vcpu_thread if necessary. The function make_reschedule_request drives the thread switch between vcpu_thread and default_idle. During starting a VM: after create a vCPU, BSP calls schedule_vcpu through start_vm, AP calls schedule_vcpu through vlapic INIT-SIPI emulation, finally this vCPU runs in a vcpu_thread loop. During shutting down a VM: pause_vm function call makes a vCPU running in vcpu_thread to schedule out to default_idle. The following reset_vcpu and destroy_vcpu de-init and then destroy this vCPU instance. During IOReq handling: after an IOReq is sent to DM for emulation, a vCPU running in vcpu_thread schedules out to default_idle through acrn_insert_request_wait->pause_vcpu. After DM complete the emulation for this IOReq, it calls hcall_notify_ioreq_finish->resume_vcpu and makes the vCPU schedule back to vcpu_thread to continue its guest execution. Handle softirq by calling do_softirq. Check if vcpu_thread needs to schedule out to default_idle by reschedule request. If needed, then schedule out to default_idle. VM Enter by calling start/run_vcpu, then enter non-root mode to do guest execution. VM Exit from start/run_vcpu when guest trigger vm exit reason in non-root mode. Handle vm exit based on specific reason. The guests CR registers 0, 2, 3 and 4. These registers are rarely used. Access to them is always from/to VMCS. Registers are in VMCS but not list in the two cases above. Get target vCPU’s general purpose registers value in run_context. the value of the register. Set target vCPU’s general purpose registers value in run_context. Get & cache target vCPU’s RIP in run_context. Update target vCPU’s RIP in run_context. Get & cache target vCPU’s RSP in run_context. Update target vCPU’s RSP in run_context. Get & cache target vCPU’s EFER in run_context. Update target vCPU’s EFER in run_context. Get & cache target vCPU’s RFLAGS in run_context. Update target vCPU’s RFLAGS in run_context. Get & cache target vCPU’s CR0 in run_context. Update target vCPU’s CR0 in run_context. Get & cache target vCPU’s CR2 in run_context. Update target vCPU’s CR2 in run_context. Get & cache target vCPU’s CR4 in run_context. Update target vCPU’s CR4 in run_context. Details of each vm exit reason handler are described in other sections. ACRN uses the function acrn_handle_pending_request to handle requests before VM entry in vcpu_thread. 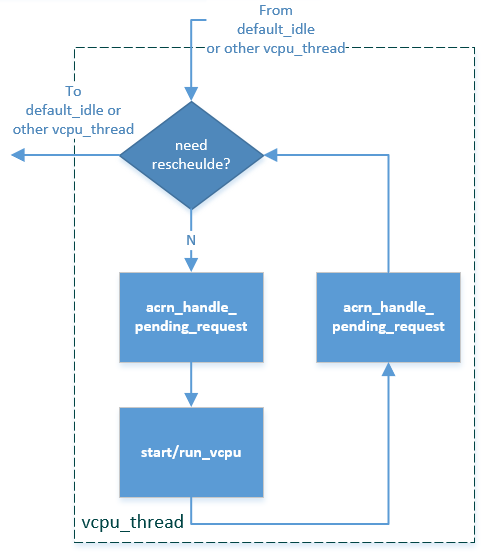 ACRN provides the function vcpu_make_request to make different requests, set the bitmap of corresponding request, and notify the target vCPU through IPI if necessary (when the target vCPU is not currently running). See section 3.5.5 for details. For each request, function acrn_handle_pending_request handles each request as shown below. Refer to the interrupt management chapter for request handling order for exception, nmi, and interrupts. For other requests such as tmr update, or EPT flush, there is no mandatory order. ACRN will attempt to initialize the vCPU’s VMCS before its first launch with the host state, execution control, guest state, entry control and exit control, as shown in the table below. The table briefly shows how each field got configured. The guest state field is critical for a guest CPU start to run based on different CPU modes. One structure boot_ctx is used to pass the necessary initialized guest state to VMX, used only for the BSP of a guest. vector will always come from vlapic INIT-SIPI emulation. CPUID access from guest would cause VM exits unconditionally if executed as a VMX non-root operation. ACRN must return the emulated processor identification and feature information in the EAX, EBX, ECX, and EDX registers. To simplify, ACRN returns the same values from the physical CPU for most of the CPUID, and specially handle a few CPUID features which are APIC ID related such as CPUID.01H. ACRN emulates some extra CPUID features for the hypervisor as well. There is a per-vm vcpuid_entries array, initialized during VM creation and used to cache most of the CPUID entries for each VM. During guest CPUID emulation, ACRN will read the cached value from this array, except some APIC ID-related CPUID data emulated at runtime. ACRN needs to take care of some CPUID values that can change at runtime, for example, XD feature in CPUID.80000001H may be cleared by MISC_ENABLE MSR. ACRN always enables MSR bitmap in VMX_PROC_VM_EXEC_CONTROLS VMX execution control field. This bitmap marks the MSRs to cause a VM exit upon guest access for both read and write. The VM exit reason for reading or writing these MSRs is respectively VMX_EXIT_REASON_RDMSR or VMX_EXIT_REASON_WRMSR and the vm exit handler is rdmsr_vmexit_handler or wrmsr_vmexit_handler. MSR_IA32_BIOS_UPDT_TRIG BIOS update trigger work for update microcode from SOS, the signature ID read is from physical MSR, and a BIOS update trigger from SOS will trigger a physical microcode update. MSR_IA32_MTRR_CAP Memory type range register related Handled by MTRR emulation. ACRN emulates mov to cr0, mov to cr4, mov to cr8, and mov from cr8 through cr_access_vmexit_handler based on VMX_EXIT_REASON_CR_ACCESS. Currently mov to cr8 and mov from cr8 are actually not valid as CR8-load/store exiting bits are set as 0 in VMX_PROC_VM_EXEC_CONTROLS. A VM can mov from cr0 and mov from cr4 without triggering a VM exit. The value read are the read shadows of the corresponding register in VMCS. The shadows are updated by the hypervisor on CR writes. For mov to cr0 and mov to cr4, ACRN sets cr0_host_mask/cr4_host_mask into VMX_CR0_MASK/VMX_CR4_MASK for the bitmask causing vm exit. As ACRN always enables unrestricted guest in VMX_PROC_VM_EXEC_CONTROLS2, CR0.PE and CR0.PG can be controlled by guest. For mov to cr0 emulation, ACRN will handle a paging mode change based on PG bit change, and a cache mode change based on CD and NW bits changes. ACRN also takes care of illegal writing from guest to invalid CR0 bits (for example, set PG while CR4.PAE = 0 and IA32_EFER.LME = 1), which will finally inject a #GP to guest. Finally, VMX_CR0_READ_SHADOW will be updated for guest reading of host controlled bits, and VMX_GUEST_CR0 will be updated for real vmx cr0 setting. The mov to cr4 emulation is similar to cr0 emulation noted above. ACRN always enables I/O bitmap in VMX_PROC_VM_EXEC_CONTROLS and EPT in VMX_PROC_VM_EXEC_CONTROLS2. Based on them, pio_instr_vmexit_handler and ept_violation_vmexit_handler are used for IO/MMIO emulation for a emulated device. The emulated device could locate in hypervisor or DM in SOS. Please refer to the “I/O Emulation” section for more details. For SOS, the default I/O bitmap are all set to 0, which means SOS will pass through all I/O port access by default. Adding an I/O handler for a hypervisor emulated device needs to first set its corresponding I/O bitmap to 1. For UOS, the default I/O bitmap are all set to 1, which means UOS will trap all I/O port access by default. Adding an I/O handler for a hypervisor emulated device does not need change its I/O bitmap. If the trapped I/O port access does not fall into a hypervisor emulated device, it will create an I/O request and pass it to SOS DM. For SOS, EPT maps all range of memory to the SOS except for ACRN hypervisor area. This means SOS will pass through all MMIO access by default. Adding a MMIO handler for a hypervisor emulated device needs to first remove its MMIO range from EPT mapping. For UOS, EPT only maps its system RAM to the UOS, which means UOS will trap all MMIO access by default. Adding a MMIO handler for a hypervisor emulated device does not need to change its EPT mapping. If the trapped MMIO access does not fall into a hypervisor emulated device, it will create an I/O request and pass it to SOS DM. ACRN implements a simple instruction emulation infrastructure for MMIO (EPT) and APIC access emulation. When such a VM exit is triggered, the hypervisor needs to decode the instruction from RIP then attempt the corresponding emulation based on its instruction and read/write direction. ACRN currently supports emulating instructions for mov, movx, movs, stos, test, and, or, cmp, sub and bittest without support for lock prefix. Real mode emulation is not supported. Is the instruction supported? If not, inject #UD to guest. Is GVA of RIP, dest, and src valid? If not, inject #PF to guest. Is stack valid? If not, inject #SS to guest. If step 2 succeeds, check the access direction. If it’s a write, then do emulate_instruction to fetch MMIO request’s value from instruction operands. 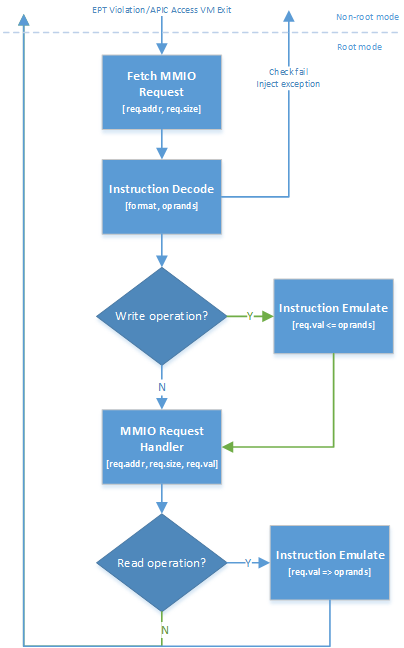 If the access direction is read, then do emulate_instruction to put MMIO request’s value into instruction operands. Guest vCPU execution of RDTSC/RDTSCP and access to MSR_IA32_TSC_AUX does not cause a VM Exit to the hypervisor. Hypervisor uses MSR_IA32_TSC_AUX to record CPU ID, thus the CPU ID provided by MSR_IA32_TSC_AUX might be changed via Guest. RDTSCP is widely used by hypervisor to identify current CPU ID. Due to no VM Exit for MSR_IA32_TSC_AUX MSR register, ACRN hypervisor saves/restores MSR_IA32_TSC_AUX value on every VM Exit/Enter. Before hypervisor restores host CPU ID, rdtscp should not be called as it could get vCPU ID instead of host CPU ID. 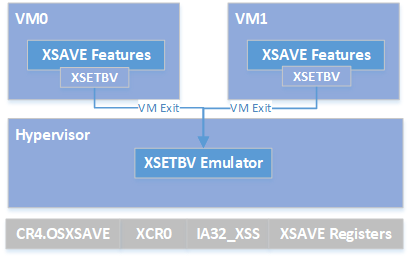 XGETBV and XSETBV allow software to read and write the extended control register XCR0, which controls the operation of the XSAVE feature set. XSAVE, XSAVEOPT, XSAVEC, and XSAVES are four instructions that save processor state to memory. XRSTOR and XRSTORS are corresponding instructions that load processor state from memory. XSETBV, XSAVES, and XRSTORS can be executed only if CPL = 0. Enabling the XSAVE feature set is controlled by XCR0 (through XSETBV) and IA32_XSS MSR. Refer to the Intel SDM Volume 1 chapter 13 for more details. By default, ACRN enables XSAVES/XRSTORS in VMX_PROC_VM_EXEC_CONTROLS2, so it allows the guest to use the XSAVE feature. Because guest execution of XSETBV will always trigger XSETBV VM exit, ACRN actually needs to take care of XCR0 access. As ACRN emulate vCPU with partition mode, so based on above rules 5 and 6, a guest vCPU will fully control the XSAVE feature in non-root mode.